Cramer Effect - What Does It Mean? 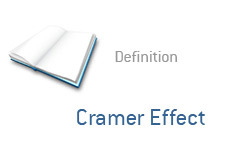 What is the definition of the "Cramer Effect"? What does the term "Cramer Effect" mean? Jim Cramer, in case you didn't know, is the host of "Mad Money with Jim Cramer" on CNBC. He is also a co-founder and frequent contributor on Thestreet.com. Say what you want about Jim Cramer (and many people have a great deal to say about him), but one thing is undeniable - many people blindly follow Jim Cramer, and will buy/sell any stock if Cramer recommends it. This has created what many people now know as the "Cramer Effect", or "Jim Cramer Effect". If tens of thousands of people are following Cramer and buying/selling based on his commands, then this will obviously create situations where Cramer "moves" a stock up or down, solely based on his recommendation. For instance, Jim Cramer recommends XYZ on his "Mad Money" show. The stock, which closed at $20 even before Cramer's recommendation, spikes up to $21 in afterhours trading as Cramer's followers start piling into the stock. The next day, XYZ gaps up to $22.25 and ends up closing at $21.30. This is the "Cramer Effect". In summary, the "Cramer Effect" is the result of thousands of people following the advice of Jim Cramer, which results in short-term price fluctuations.